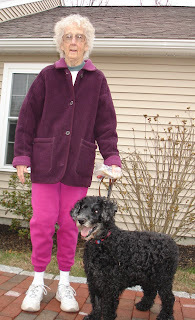 Last fall one of our volunteers matched a lovely senior from a nearby town looking for a walking companion, with a senior dog who had been heartlessly abandoned. It was a great match, and the pair visited the shelter from time to time, which always made our day. Sadly, Curly, the senior dog, died suddenly yesterday. We are all grateful that his caretaker was able to give him such a great last year, and only wish they had more time together.